Discussion in 'Custom Cases & Projects' started by K888D, Apr 11, 2016. 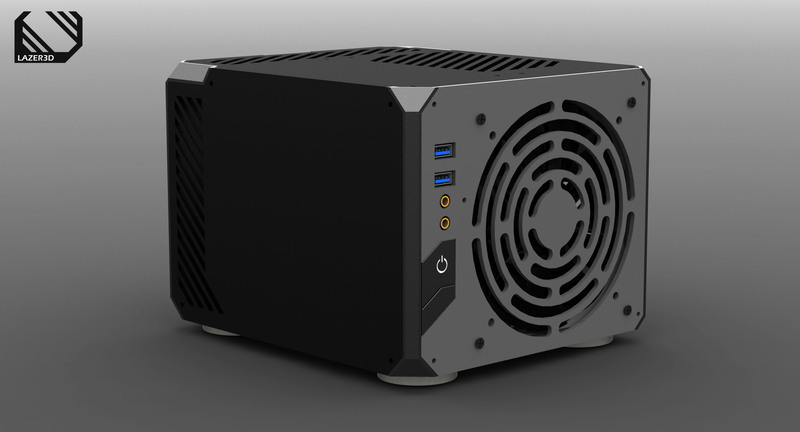 APU development at the time stalled topping out with Kaveri and ZEN being a long time away, so my focus shifted to expanding the concept into a cube case that took advantage of the rising popularity of powerful ITX length GPU's such as the Radeon R9 Nano. 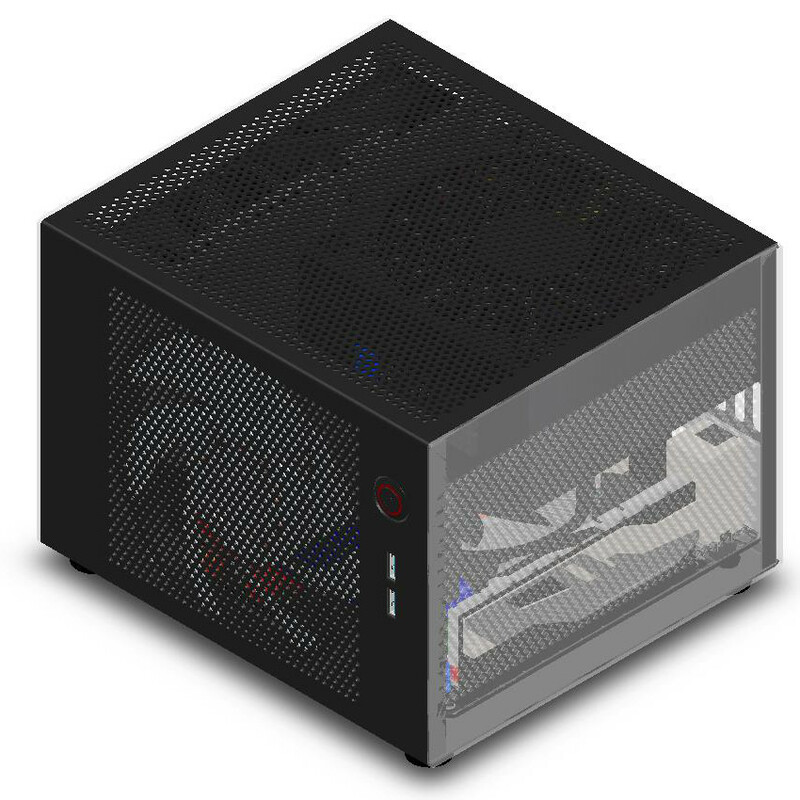 The concept worked well keeping the CPU and GPU at good temperatures at a reasonable noise level, however a primary objective was for the system to run quietly whilst gaming so the decision was made to expand the case to allow for a side fan to be fitted. Experimenting with the card mock up I quickly learned that graphics card exhaust heat in multiple directions, this heat bounces off case walls recirculating and slowly increasing system temperatures over time. 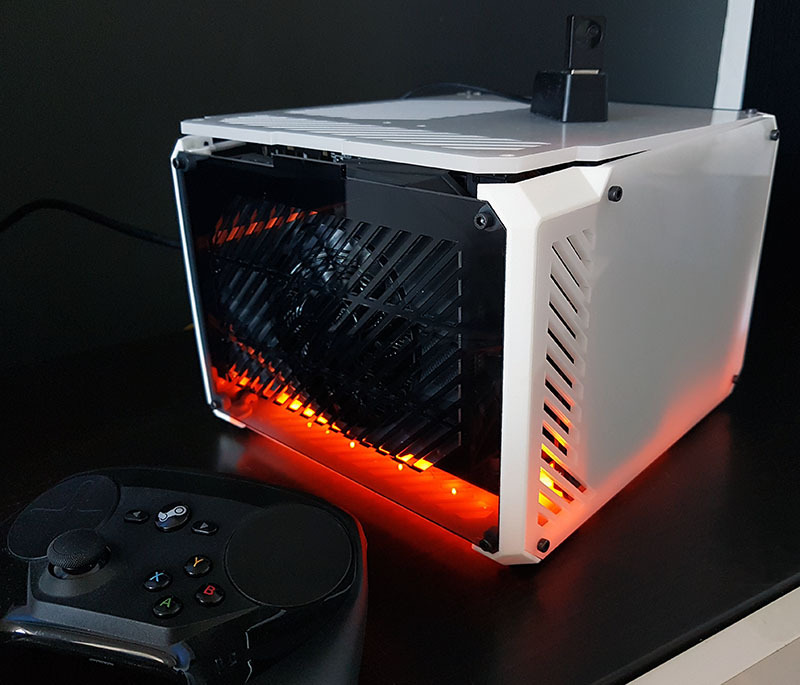 Adding vents in front of above and below the GPU made a huge difference to temperatures, this became a primary design feature of the case with 360 direct GPU exhaust ventilation. As you would expect the addition of the side fan had a massive impact on thermal performance, in combination with the exhaust ventilation on the opposite side of the case to the fan it created a wind tunnel effect preventing system wide heat re-circulation. 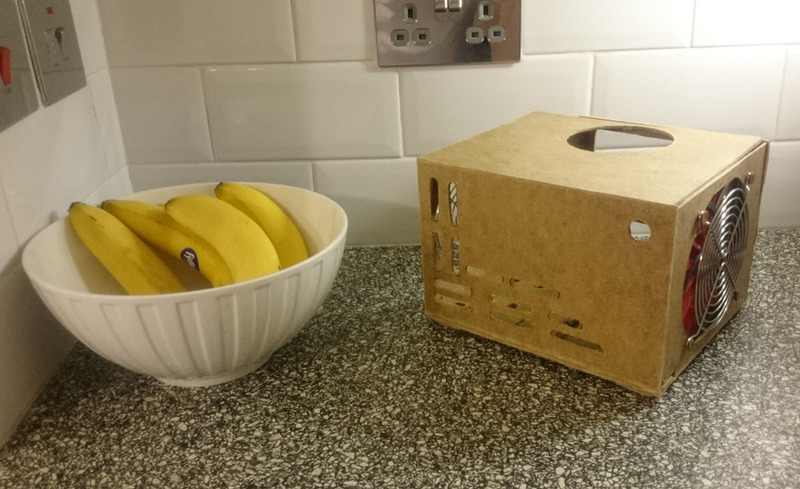 The prototype went together nicely and early testing achieved great thermal results, the design was positively received by the community in this forum and elsewhere. 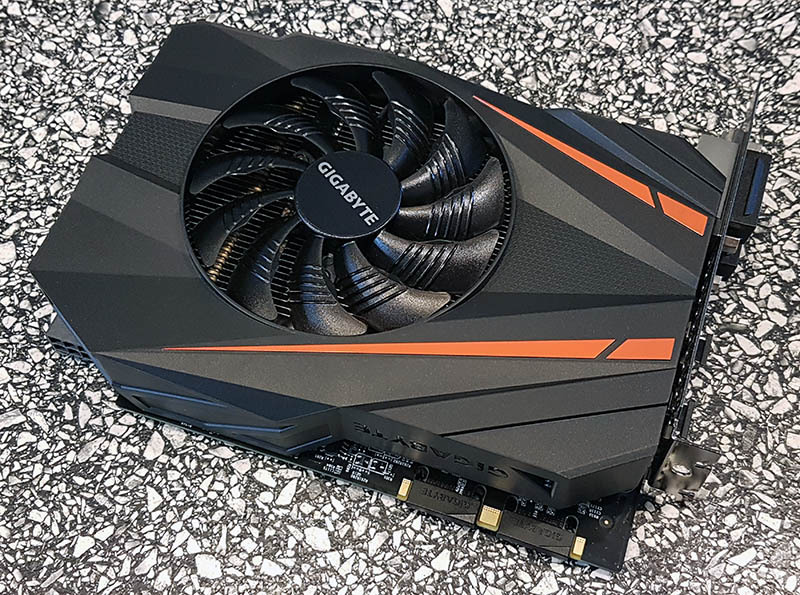 At the time of getting this prototype our SFF prayers were answered and Gigabyte announced an ITX length version of the mighty GTX 1070! Only issue being the card was rather tall, regardless I ordered one straight away for testing. It turned out to be the perfect companion for this case pushing the performance per liter through the roof! 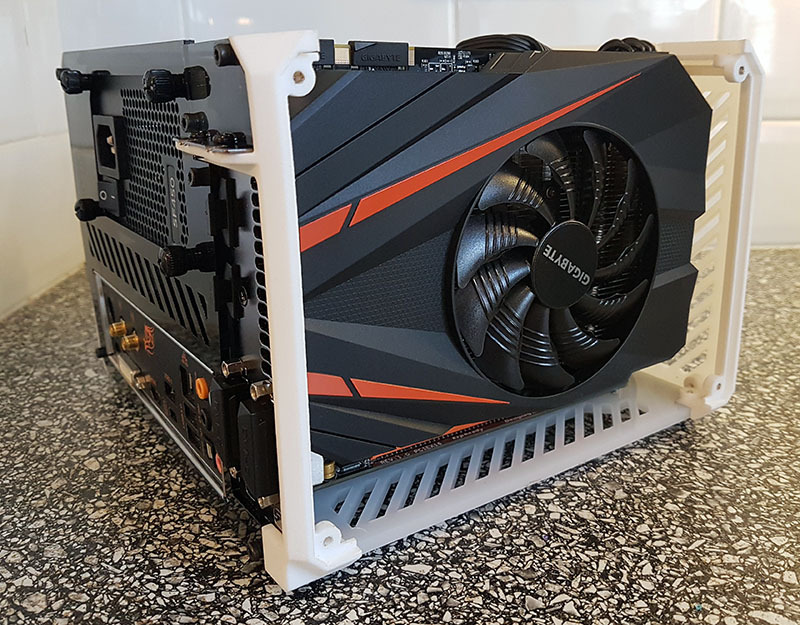 The Gigabyte GTX 1070 ITX fit nicely into the new design, the increased height opened up the possibility to fit CPU coolers up to 65mm in height. The results were impressive with the Big Shuriken 2 managing to keep an i5-6500 under 50C during extended Prime95 CPU stress testing, whats more impressive is this temperature was achieved with a very quiet fan speed of around 900 rpm. Next up focus was switched to preparing a small production run, refining the smaller details such as screw types and accessories, branding, along with launching an online store and blog to support the project. 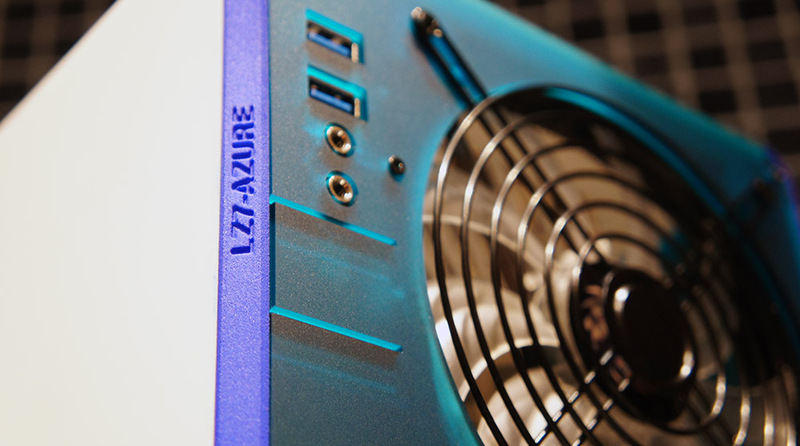 A small run of production cases went on sale in late 2016 named the LZ7 First Edition, they were sold to SFF enthusiasts around the world and received a positive reception. Taking on board the feedback received from the First Edition the case went through a series of further improvements and additions to refine the design. Feedback from the community was generally against this as most people wanted to have physical buttons to press instead, the IO design was revisited to add back the physical buttons but with an updated aesthetic which better suits the overall case design. The LZ7 First Edition caught the eye of Overclockers UK who invited me to their Headquarters for a meeting to discuss working together on bringing the case to market on a larger scale through their online store. This was pretty much a dream come true and a massive opportunity which I could not refuse! We have since been working out all the various details towards a product launch targeted for August 2017. The GTX 1070 is probably going to be the most powerful ITX card of this generation, AMD may be able to beat it with Vega, but that's in the future. Aside from the R9 Nano at 175W TDP, the GTX 1070 and GTX 970 (or an RX 480 ITX if they ever release one) are realistically the highest TDP cards you can put in this case at 150W. - The first line shows the ambient temperature and noise of my living room where the testing took place. - Games were tested at 1080p 60Hz with Ultra settings and maximum AA applied. - Games were left to run for minimum of 1 hour to allow the system to stabilise. - Noise levels were measured at 20cm distance from the GPU side of the computer. - The Gigabyte GTX 1070 ITX has a base clock of 1531 Mhz and a boost clock of 1721 Mhz. Witcher 3 looked absolutely stunning, but surprisingly it stressed the GPU the least of the 3 games tested probably due to its capped framerate. Battlefield 4 was the most demanding game on the system, but the end result was only a few degrees difference between games resulting in a gaming noise level of around 27dB, making it difficult to hear from 3.5 meters away. Even with GPU and System fan profiles set to their lowest/quietest, the GPU clock speed never dropped below its 1721 Mhz boost speed, in fact in most tests the GPU exceeded its boost maintaining speeds above 1800 Mhz. SFINGEMORTA, Nanook, icymind and 21 others like this. 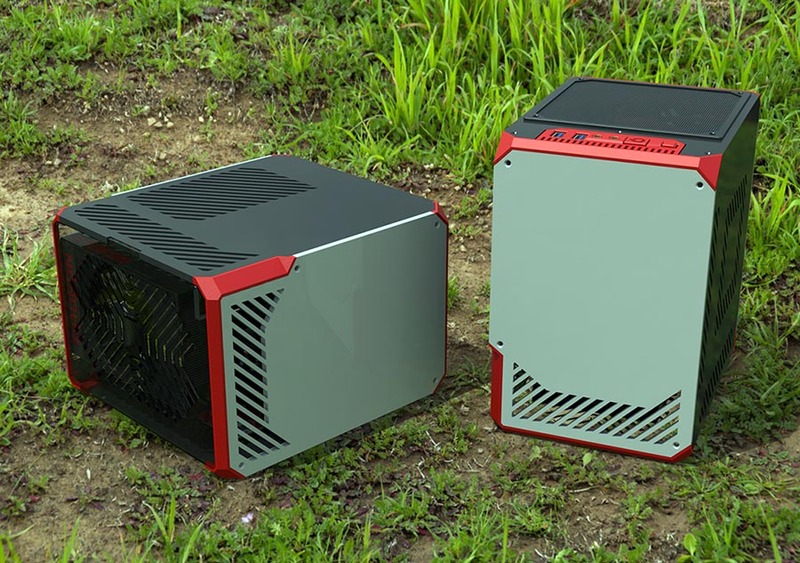 I'm loving the amount of new cases and case prototypes around in the SFF world at the moment. 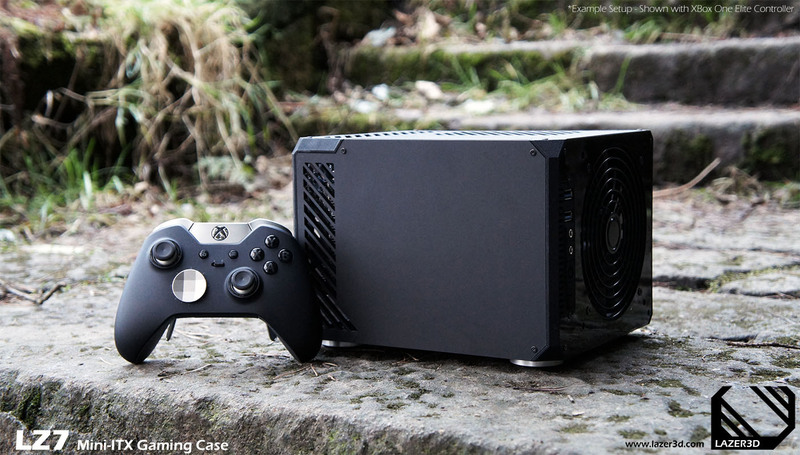 I doubt the full sized form factor world is seeing such attention from indie case makers. 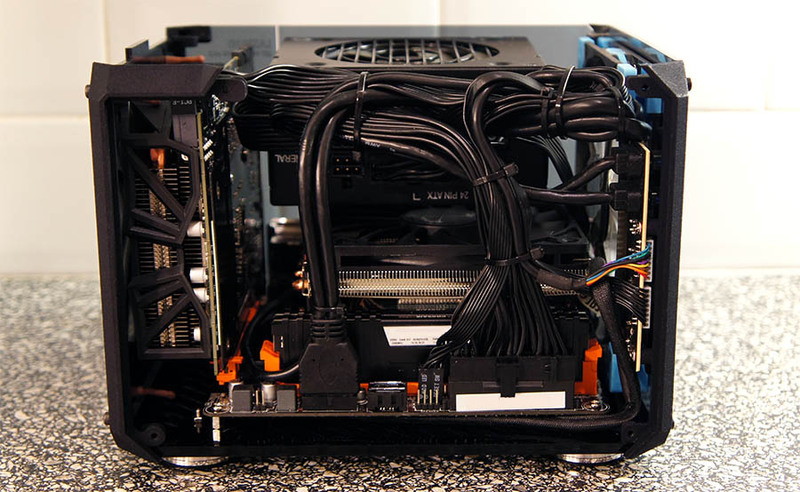 My only opinion thus far: I believe the case should include room for the top mounted PCIe power connectors - a majority of mid-ranged 'ITX' sized cards use the top mounting location. Do you produce yourself? Do you plan to make those batches of 20 cases yourself. I've also seen a 4 liter case here. Hard to compete with that. But being the smallest without a PCI-e riser you could be the king right now. Nice looking case. 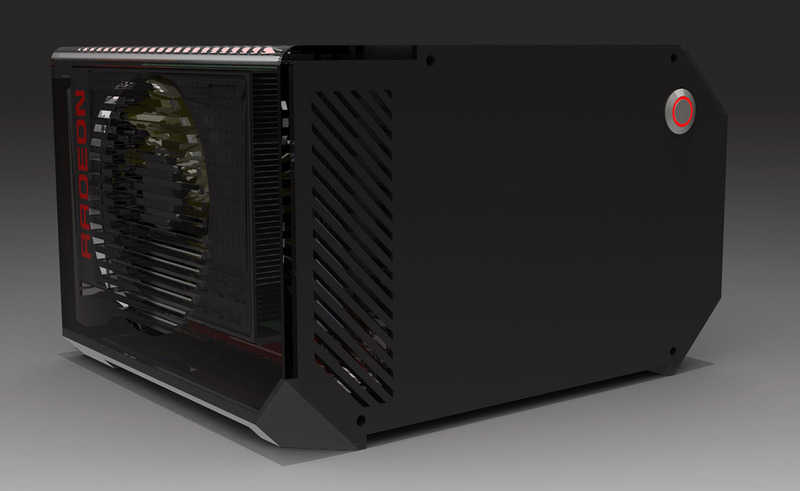 It's similar to a design I had in my head, also with a R9 Nano in mind, except oriented vertically so the GPU fan faces the bottom. The chamfered corners and rounded edge give it personality. What is the maximum height for the CPU cooler in this case? Right now I agree with @confusis, limiting cards to just those that don't have top-mounted power connectors eliminates a lot of good cards. If you aren't planning to release it real soon you may wait until the Pascal and Polaris cards are revealed, maybe things will change with the switch to a more efficient process node. Edit: How do you find the flexibility of the cables on the SF450? I really like this design a lot, very nice job. Thank you very much, and thank you everyone for the kind comments. These are very good points and something I have been thinking hard about whilst I have been developing the case. My thinking at the moment is that there will be 2 versions of the case, the one pictured above being the low profile version. 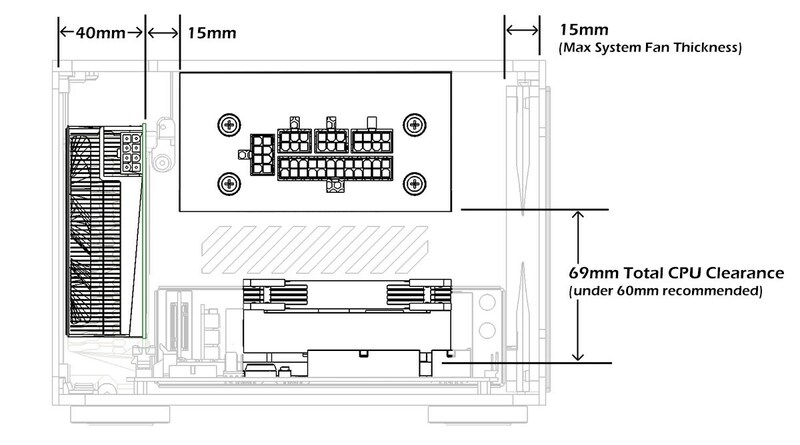 In terms of new ITX cards, (to my knowledge) all of the latest ITX cards do not have the power connector on the top. I am hoping this is a trend going forward. For example the GTX 950 cards do not have a power connector at all. The next new release before these cards was the R9 Nano (please correct me if I've missed anything), this has its power connector facing towards the rear of the card. It would be great if this will be the norm going forward, although I doubt it. I will concentrate my efforts on the full height case, with the intention of having a lower profile version for those who will want to squeeze out that extra 1 litre of volume. 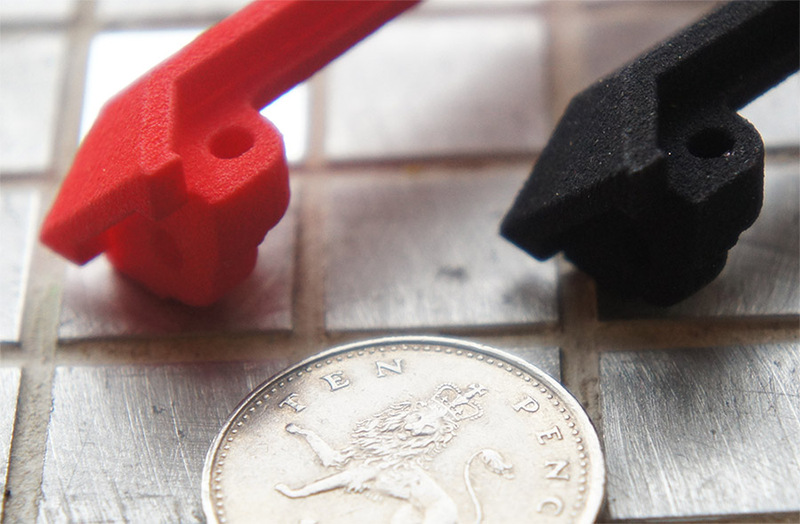 One of the great things about using Acrylic is the relatively low cost for low volume manufacture, for this reason you can produce different designs without increasing the price too much. Secondly the corner attachment method does not need to be adjusted to accomodate the different height panels, as they are located in the corners. For these reasons I am also considering a third case option, which will be about 30mm wider but will allow for a 120mm water cooling radiator with a slim fan, or the new Slim Tundra TD03 models from Silverstone (37mm total thickness). This wider option would give a case volume of 7.5 litres. On a side note - the 5mm Acrylic is adding around 0.7 litres volume to the case, if the case was to be made from 2mm sheet metal it would reduce to 5.2 litres for the low profile version. Just something to think about! I made the prototypes myself, is that what you mean? For the 3D print tests, we have an FDM 3D printer in the office where I work, I am hoping my boss will allow me to use it for the test prints. For the actual final case parts I am going to look into using Shapeways, I have got some basic prices from early CAD models and the prices are very reasonable. For the next prototype I am going to use 5mm knife cut foam board to replicate the Acrylic panels. After I'm happy with the design I will then move into using Acrylic sheets. I will be using a local plastic laser cutting company that I used for my other case project that can be seen here. 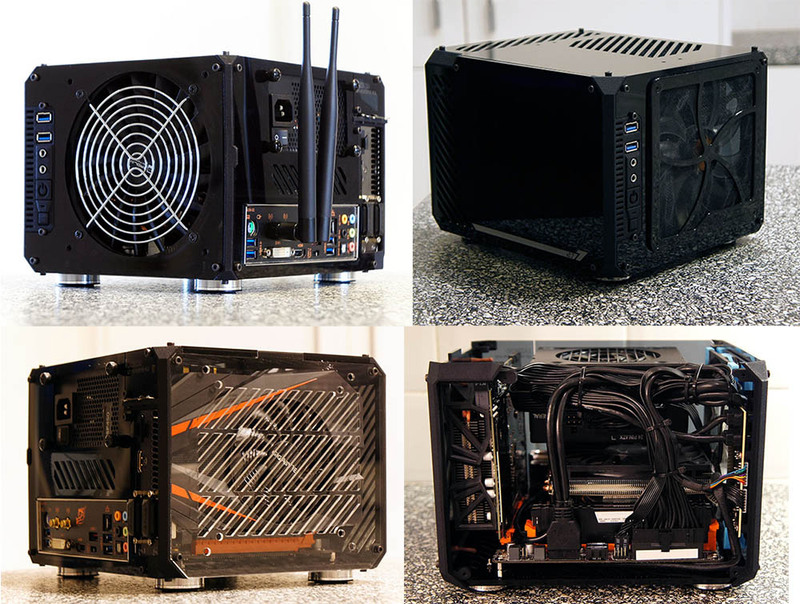 Each prototype of that case cost £120 (including the heat bent parts). 4 Litres is indeed hard to compete with, I think these guys have that end of the market covered, the designs on this forum are very impressive! This is why I decided to take a slightly different approach of not using any custom parts such as PCIe Risers, to see what is achievable if you just stick to the fundamental case layout of an upright graphics card inserted directly into the motherboard. 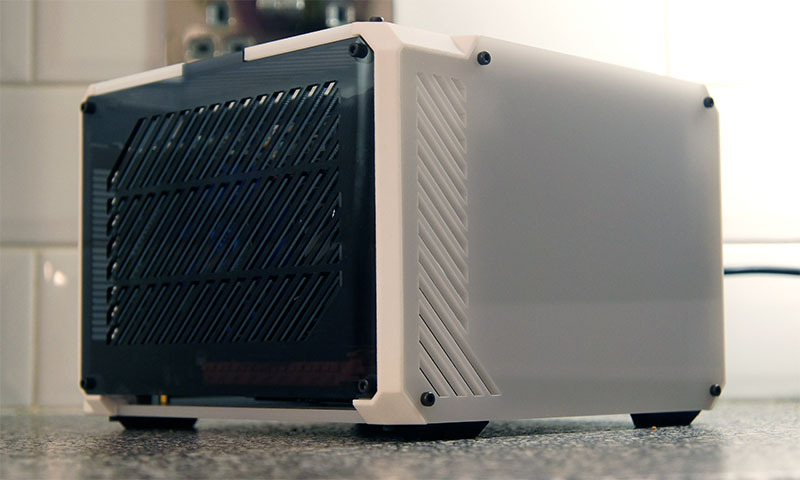 ITX cards are gaining popularity and I can't wait to see what the manufacturers come up with next using the next gen tech. You could in theory reduce the volume of this form factor drastically by creating an 'L' shaped case, I did do a quick CAD mock up of this shape, but it wasn't pretty! I am a big fan of gaming cube/shoebox style cases, to my knowledge the Silverstone SG13B is amongst the smallest that is widely available at 11.5litres in volume. But the SG13b still caters for a wide market with space for an ATX PSU, 120mm water cooling radiator and a 10 inch graphics card. 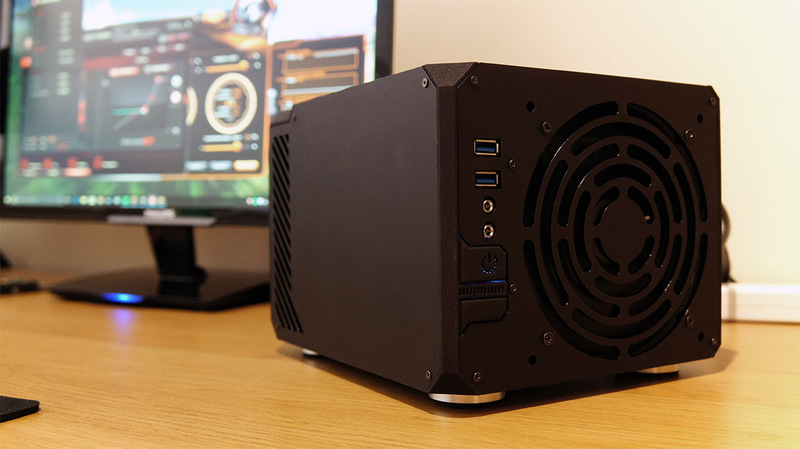 Obviously you can build a much more powerful PC with this case, but the majority of consumers cannot afford more than a GTX 970 anyway, so there is definitely a market for a smaller case that can accomodate up to a GTX 970 spec. I have also found the thermal performance of the SG13b to not be that great and I would not be comfortable with using a GPU with a TDP of above 200W. 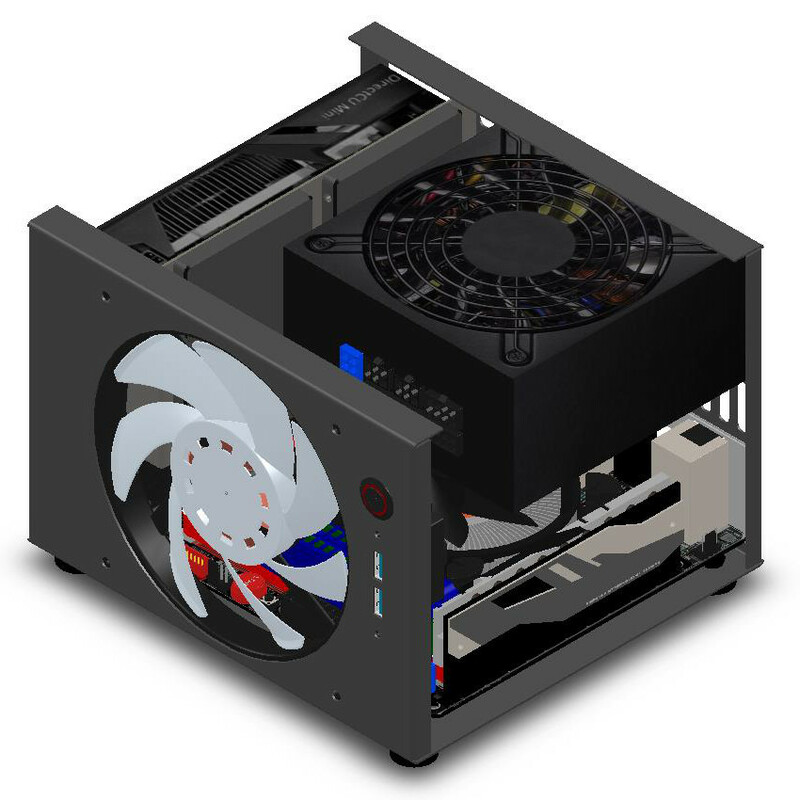 There is allot of re circulation of hot air and the front mounted fan does not extract air from the rear of the case efficiently where the CPU is located. I will check when I get home from work tonight, but the full height version can comfortably fit a Noctua NH-L9 with (I think) around 20 - 30mm clearance to the underside of the PSU. The SFX PSU stops about half way across the cooler, so the fan also has plenty of breathing room beyond the PSU. The side intake case fan also pushes cool air directly across the CPU cooler intake providing nice and cool temps. 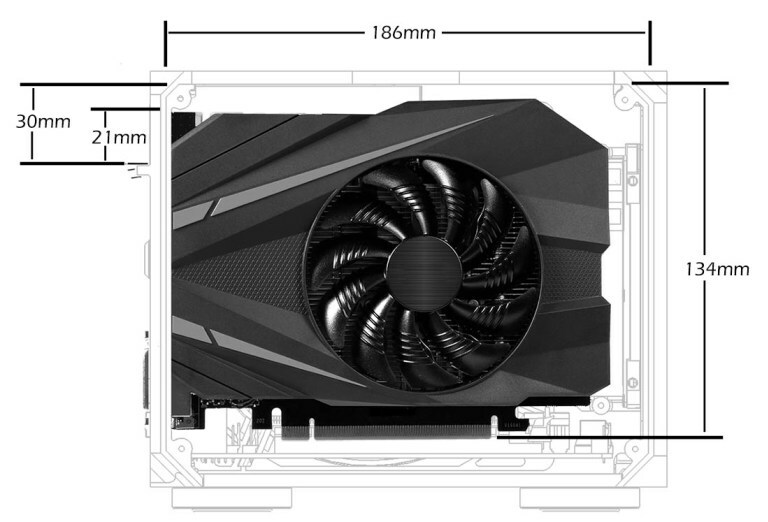 The lower height case varient (to fit the R9 Nano) will need to use a lower profile cooler than the NH-L9 such as the Zalman CNPS2X, I estimate this to be around 30mm max cooler height allowing for CPU intake clearence of around 20mm, the side intake fan will aid with the cooling helping to keep fan RPMs lower. How do you find the flexibility of the cables on the SF450? I have found the Corsair cables fairly easy to work with, they don't feel as stiff as the Silverstone ones. Routing cables in this case was suprisingly easy, although adding the HDD cage in front of the PSU may make it slightly more difficult. Very nice design and awesome renderings ! The name and logo of this project are still undecided. I decided that perhaps cardboard wasn't the most appropriate material, so instead decided to design it with Acrylic panels, the end result is a 5.9 litre chassis using 5mm thick sheet Acrylic. 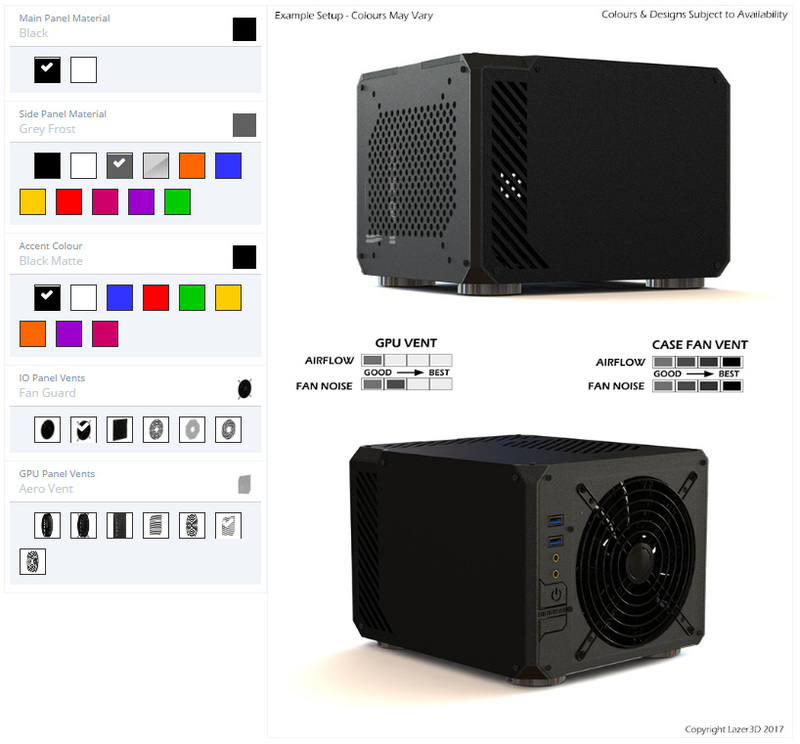 This case layout will fit a full height ITX GPU (without top mounted power connector), such as the R9 Nano, or the upcoming PCIe slot powered GTX 950’s. 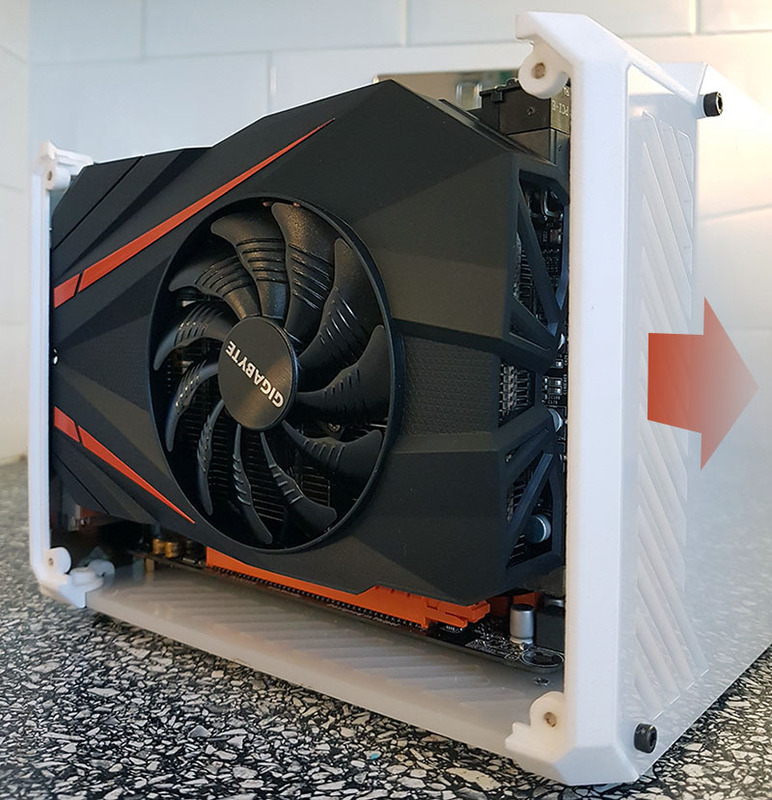 To fit a taller GPU such as the Asus GTX 970 Mini, an extra 25mm in height is required resulting in a 6.8 litres, this could be made possible as a different case variant. To fasten the Acrylic panels together I first explored the options of using T-Bolt type fastenings, however I found this method adds quite a bit of extra volume to the case due to the required overlaps. In the end I have instead settled on using custom 3D printed corners which will be used to secure each panel together and also help break the aesthetics up from looking like ‘just another cube’. The panels are secured at the corners using a nut and bolt with a custom designed clamp on the rear side pulling the panels together through some slots. I could have designed the corners to ‘clip’ the panels together, however I felt that this method would not provide sufficient rigidity with the 3D printed material. The design is still conceptual and I plan to get some 3D prints made to test it all out. I don't want to show the details of these clips just yet until I've tested them. 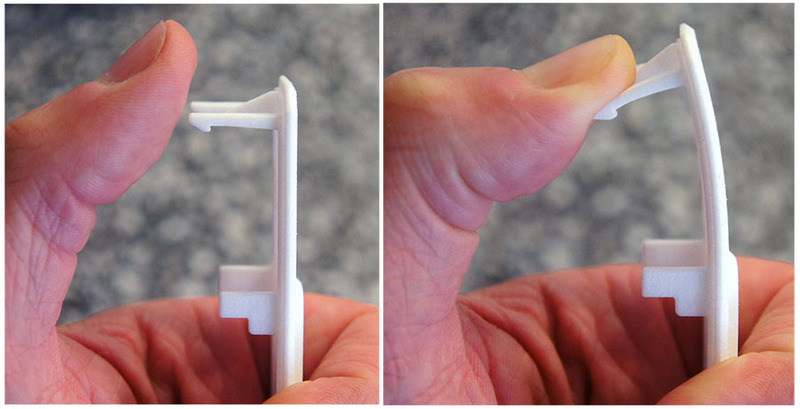 If the 3D printed corner method does not work as intended there are a few other avenues I can explore for similar results as well as moving back to the more traditional T-Bolt construction method as a last resort. To achieve primary objective 2, an SFX PSU form factor has been chosen allowing for very quiet PSU’s such as the Corsair SF450 (near silent under load) to be used. The restrictions of objective 4 mean that a conventional flat motherboard with upright Graphics card layout is to be used. Although this layout is not revolutionary, the aim is to create the smallest cube possible. Increased airflow means cooler components, cooler components mean slower fan speeds, so for that reason I have decided to increase the case width slightly to allow an intake fan to be added. I toyed with the idea of natural ventilation only which was tested in the first prototype, however the CPU fan span up higher than I would have liked with higher noise output than I was comfortable with. 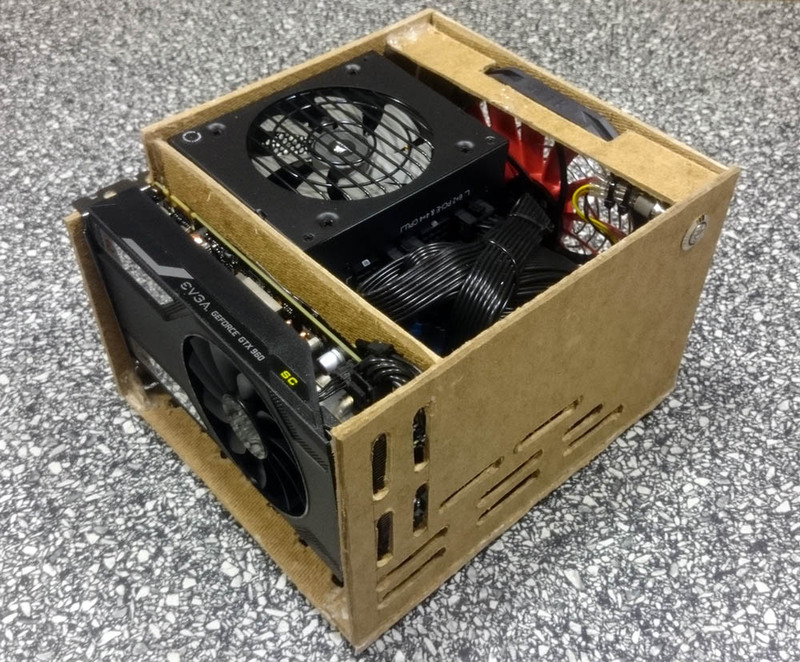 In the plywood prototype a 140mm fan was installed (I think the final version will only allow for a 120mm fan with tall cards, and a 92mm fan in the R9 Nano version). This configuration delivered amazing cooling performance for both the CPU and GPU, resulting in much reduced noise output from both the CPU and surprisingly the GPU also. The end result was virtually silent under normal usage and a low level hum from across the room whilst under full GPU and CPU stress testing. The hard drive rack will sit in between the power button and graphics card, there should be enough room for up to 3x 2.5" HDDs and still have room for the PSU wiring, or an SFX-L PSU without any HDD's installed. The side panel will be made from a transparent Acrylic to show off the GPU. I've not settled on the grill designs yet, whether they will be slotted like in the picture, or a complete cut out with a dust filter or fan guard. A range of options can be made available to suit the user's preference whether they want the best style (slotted arrangement), best noise/thermal solution (fan guard), or best practical solution (dust filter). 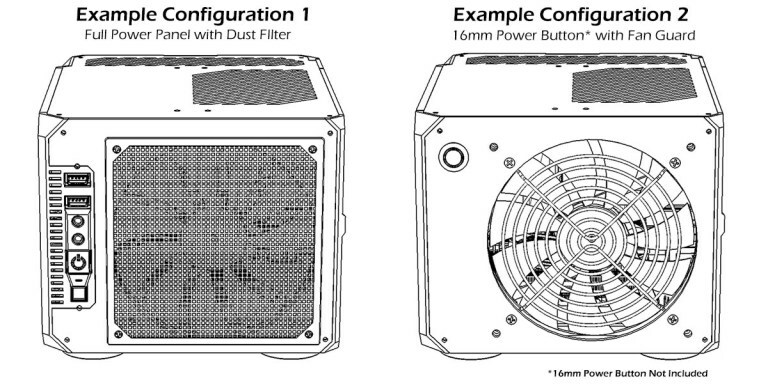 As you may be able to see the Graphics card will create its own chamber, cool air can be drawn in and heat is dispersed out of vents located on the top, bottom and front panels. The positive pressure design of the case also helps with forcing the warm GPU air through these vents. 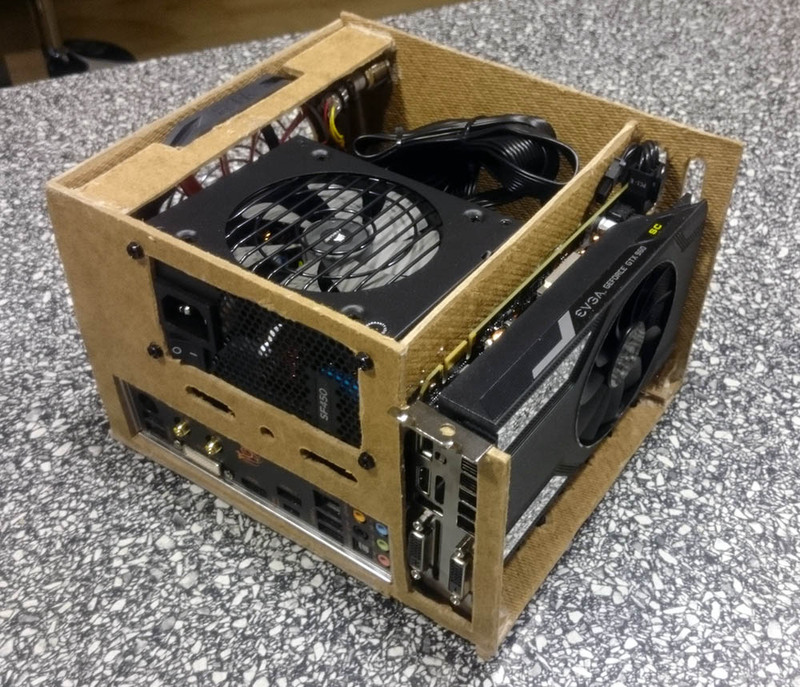 In the plywood prototype this setup worked very well, the GTX 960 did not throttle during stress testing and also ran surprisingly quiet. Looks very good. Not sure how it will work in terms of assembly, but I'm sure you thought it through. Normally I'm all about limiting component choice as little as possible, but in this case, it seems like you could absolutely have two options, and that's due to the low sales volume you're aiming at. You will find 20 people on the internet that already have or want a Nano and are just searching for the smallest case to fit it in, no problem. It's a nice inside a niche, sure, but the way you're tackling the problem makes the approach of two variants quite viable. The question is of course whether you'll be able to achieve the low price-point on that volume. Hot damn! Any plans for a handle or harness for transport? That is definitely something I would be willing to look into as an addon feature, thank you. Not sure how it will work in terms of assembly, but I'm sure you thought it through. Its not your typical PC assembly, the last component you screw in place is the PSU, I didn't struggle assembling the components into the Plywood prototype, in fact I would say it was allot easier than some of the other cube/shoebox cases I have worked with. I think that the £100 price point should be achievable, with shipping extra on top. What are your thoughts on this price, do you think people will be willing to pay this amount for this case? As the case is mainly plastic, I estimate the weight of the case without PSU to be under 1.5kg. I have had a look at some prices for shipping around the world - to the UK it would be £8 for next day delivery, for EU it would be £18 for 2 - 4 day delivery, for USA it would be £25 for a 3+ day delivery service. I am looking into a method of adding 2x USB 3.0 and Mic/headphone ports to the front of the case. These ports would bump the price up by around £15, is this price increase justified for these extra features? Awesome design man. 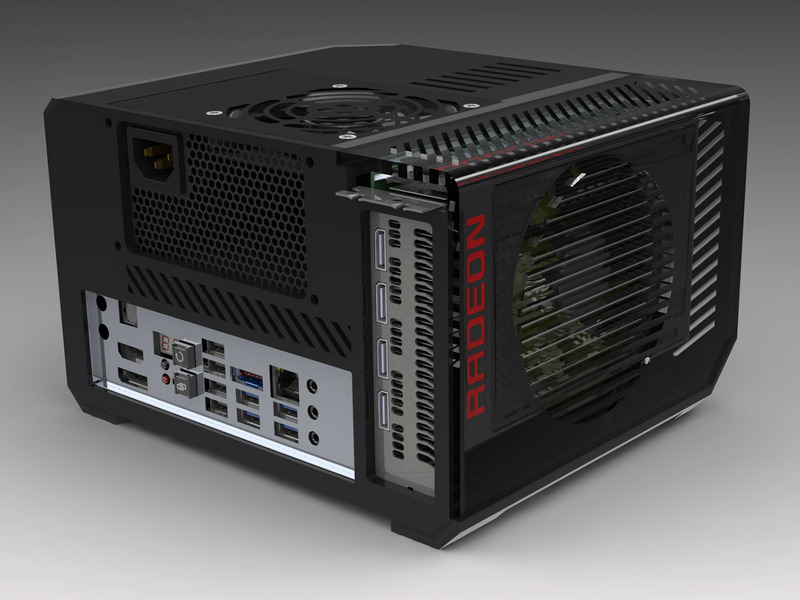 If I had the money for an R9 Nano this would be the case I'd pick to showcase it. Absolutely beautiful. Other points I want to commend you on: I like the low profile version that's strictly for front PEG ITX cards. I'm also digging 140mm side fan to keep the CPU space well ventilated. Keep up the good work, very much looking forward to future developments. I was thinking about the case itself, not the components, but good thing you brought it up, it is indeed an issue with other cases of this layout. think that the £100 price point should be achievable, with shipping extra on top. What are your thoughts on this price, do you think people will be willing to pay this amount for this case? Ah I didn't know we were talking about GBP here, that seems a little more achievable. I think that price is absolutely fine, indie SFF cases are even more expensive most of the time, so I think you're aiming for the right spot. With shipping there's always the issue of the dimensions of the case and you can try to design it in a way that it's even smaller disassembled, but I don't know whether that will help. The prices seem ok to me, but maybe there is a shipping service for the US that takes longer but is less costly? Well, that's a very good and controversial question, and I think you'll have to put up a poll once your case has gotten enough attention to find out. A lot of people will argue that front I/O makes the case uglier, some think Audio is completely unnecessary, others don't want any of it. As your sales volume is going to be very low, you could try to put the cutouts for the I/O on the side where it doesn't hurt the aesthetic too much and just include the actual I/O board as an option. That way people could choose whether they deem it worth it or not. For my case I'm exploring the route of hiding the I/O and making it upgradable, but that requires designing the I/O circuitry yourself and complicates the design significantly. This is the I/O plate that I have just received from Corsair, it has all the wiring for all the power/reset, LEDs, Audio and USB ports already wired up and labelled. I have modelled a frame which it will screw into behind the front Acrylic panel. The frame also contains spring buttons to activate the power/reset switches. The cost for this I/O panel is £10 and the 3D printed frame with buttons is coming in at about £6. 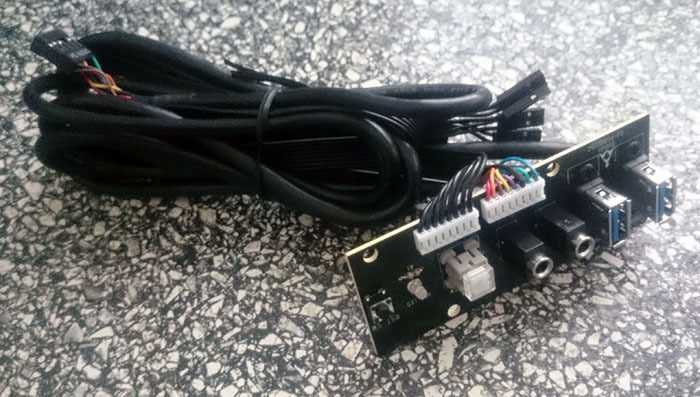 But the case will no longer require the vandall switch (which costs around £4 + custom wiring), as a bonus I will not have to do any custom wiring so it will save on assembly time. The overall cost increase would be £12. 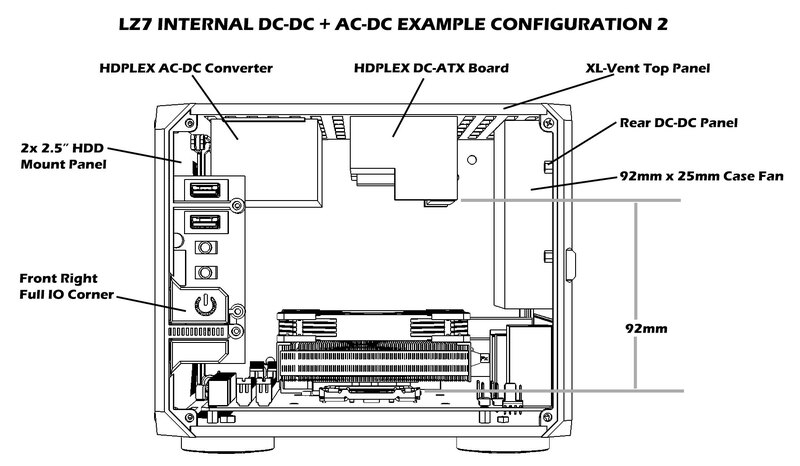 The I/O plate will be located in the same position as the current Vandall switch, or alternatively the I/O plate could be located in that same corner but on the side of the computer, but this would push the side intake fan towards the rear of the enclosure which may affect airflow performance. I will try and post some pictures of the CAD later today. Thats the first time I've seen that design, thank you for pointing it out. The layout is very similar other than the fan position. Did your brother make any progress with the design? Most motherboards position RAM width wise across the front of the motherboard, which would sit in front of the fan and partially block the direct flow path to the CPU heatsink. Reading all the various threads on this forum, there is a common theme of preference towards a clean look, although personally I think fans can add to the detail and aesthetics, I get the impression that a large fan on the front would detract from the aesthetics for most people. Does anyone have any comments on this? It is something to think about though, I also like where he has located the HDD's, very good use of the space. Although they may run cooler if they sat the other side of the PSU attached to the side panel away from the GPU. The design in the images was only an initial project's view. 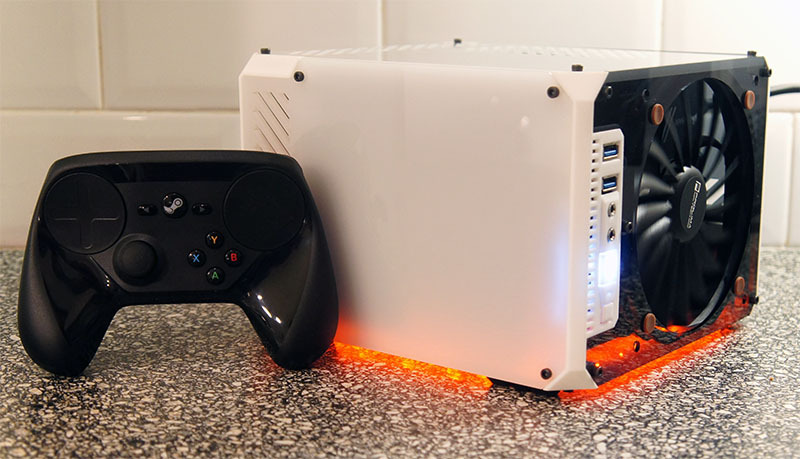 Later we made more accurate design, prepared for the production, but we stopped it, because we decided we can't make 2 different prototypes at the same time (we're also making some console-sized pc case: http://zaber.com.pl/sentry/, https://hardforum.com/threads/sentry-console-sized-gaming-pc-case-project.1832126/ ). Maybe after releasing our Sentry we will find some time to make first prototypes of this cube (if there won't be something similar on the market till that time). 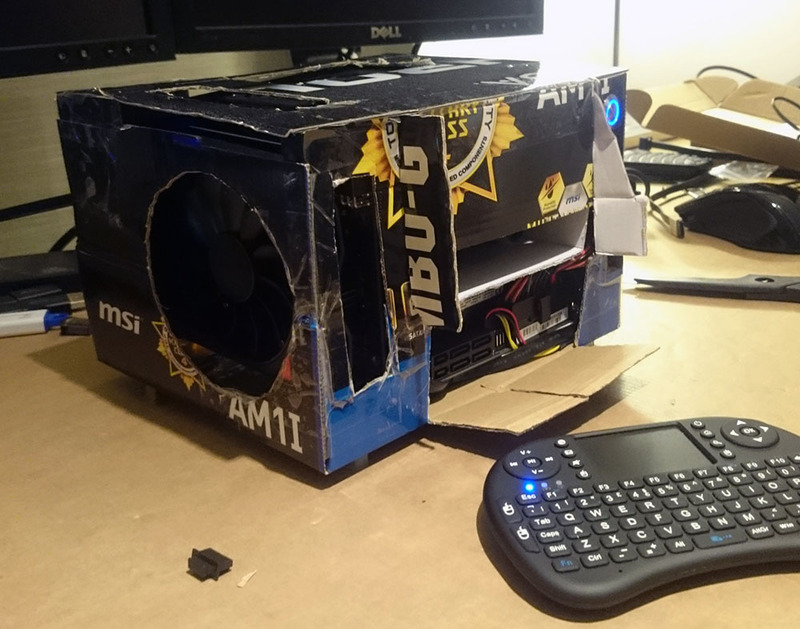 I still think You should try to place the fan in front of the case. 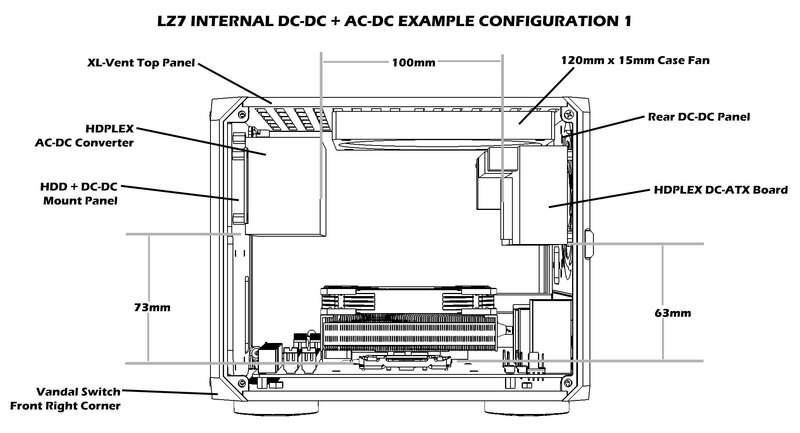 Even if Your ram will be blocking 10-30% of the fan's area, You will have an air movement through the whole case. Some cases have some additional PCB boards like in the design i posted, so in Your design they will act like memory pcb's in my bro's design. I think if You will be using 65W cpu's than You shouldn't be afraid of something like that in both situations... but everything needs to be tested. Are You preparing some prototypes other than wooden? I take your point on board about the extra PCBs on some motherboards, I will have a good think about it! I am curious to understand why you don't think the fan being on the side of the case will not have the same effect of cooling the whole case? Regarding prototypes - A friend has offered to produce some laser cut acrylic panels for me if I can get him a design for next week, so the pressure is on! I am also hoping to get some 3d prints of the corner sections done soon aswell. That looks like a good idea, adds functionality and makes your life easier. Seems to be absolutely worth the additional cost. Well you'll probably kill the clean look for some people by having front Audio and USB ports. 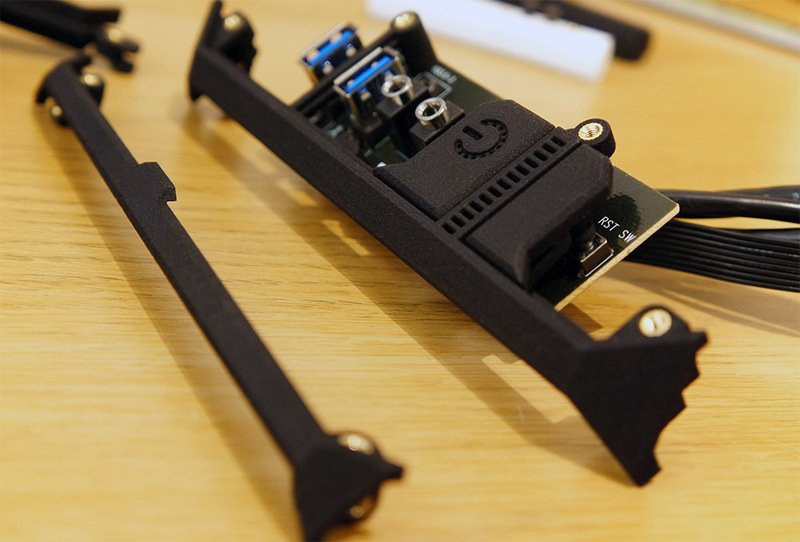 Maybe you could combine the part it will be mounted to and the part of the case where it sits to be one L-shaped piece that allows to mount the I/O to either the front or the side. That way you'll get super-clean looks for one group of people and super-quick access to I/O for the other group.